Product #55511 | SKU APT100-10000M-5V-CGR | 0.0 (no ratings yet) Thanks for your rating! 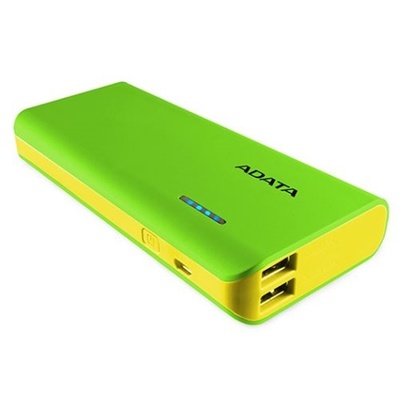 The ADATA PT100 Power Bank with Flashlight (Green/Yellow, 10000mAh) offers high-capacity 10000mAh charging via two USB outlets. Charge your smartphone and tablet simultaneously and quickly. Use your PT100's handy LED flashlight to light up your mobile life! No need to worry about running out of power when you're on the go! The PT100 comes with a whopping 10000mAh charge capacity – enough for up to 3.7 full charges for an iPhone, and charges for an iPad Mini. Over-Discharge Protection and Over-Currnet Protection. Available in even more colors than before! Output current will vary depending on the input charge properties of the device being charged.